Breakfast, brunch, lunch or dinner, you can’t go wrong with Quiche. It can be a hearty and filling meal addition. For breakfast or brunch, it’s great served with some fruit and a few slices of bacon. Add a salad and you have a lunch or dinner option. With our chickens laying between 4-7 eggs (plus the duck laying almost every day too! ), we are ending up with a huge vast amount of eggs – as of this morning, we have 52 eggs – before todays offering from the ladies. For a household of 2, even with our love of eggs, that’s a lot to eat up. 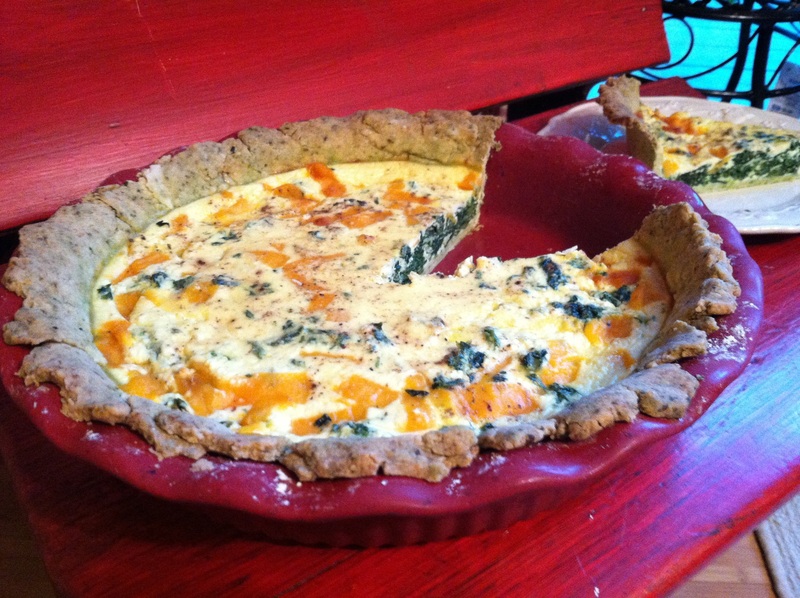 What better way to use up some of that egg surplus than quiche! You COULD make this a crustless version (just skip the part about the crust and follow the balance of the directions) but it’s pretty tasty so I don’t know WHY would actually WANT to. I whipped this up over the weekend so that I could have something tasty to heat up for breakfast during the work week. This would also do well in the freezer to save for when you have unexpected breakfast guests or need something to take to a pot luck. Just partially bake it (in an aluminum pan, you do not want to use ceramic as the frozen to hot oven will most likely break your dish)- 20 minutes in the 375 degree oven, remove and let cool to room temp. Freeze with a double layer of saran. To finish cooking, remove from the freezer and place in your preheated 375 degree oven, cooking for 30-40 minutes until center is set. Preheat your oven to 375 degrees. Spray your 9″ pie pan with non stick cooking spray. Roll out your Chive Pate Brisee and place in your prepared pie plate. Press down the edges and trip off any excess crust. I did a rough edge for my Quiche, but you can pretty yours up if you like. Puncture the base of the crust with a fork. 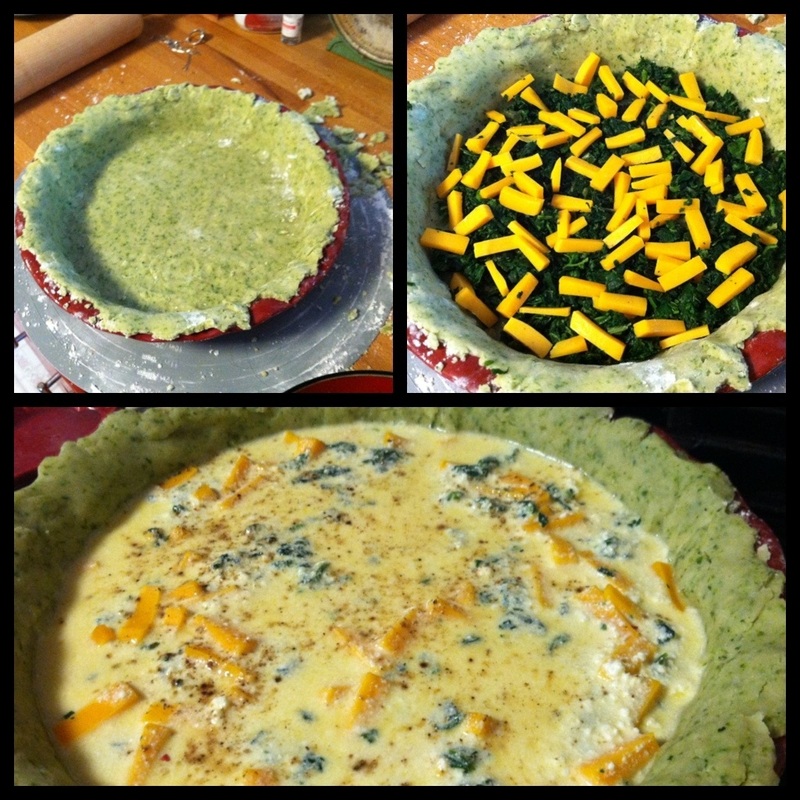 Add your spinach to your crust, distributing evenly. Sprinkle the spinach with your chopped cheddar cheese. In a small bowl, add your eggs, milk and ricotta cheese, whisking to combine. Pour your egg mixture over the spinach & cheese. Season with kosher salt & pepper. Place your Quiche into your preheated oven, cooking for 40-45 minutes, until center is only slightly jiggly. Remove from oven and let sit for 10 -15 minutes to finish setting the Quiche. Serve hot. Refrigerate or freeze any leftovers. In the bowl of a food processor, combine flour, salt and chives, pulsing a few times to combine. Drop your cubes of butter into the flour mixture, and pulse until the dough resembles a dry coarse crumb. Turn your food processor on and slowly add the ice water through the feed tube in a steady stream just until the mixture starts to come together. If dough appears to still be crumbly, add more ice water, 1 tablespoon at a time. Turn dough out onto a piece of saran wrap, press together into a flat disc and refrigerate for at least 1 hour. You can also freeze the dough, double wrapping in saran. Bake according to directions for your recipe. Garden Bounty – When you are over-run with tomatoes, make some Tomato Jam! I’m not gonna lie. This year, gardening kind of sucked. With the really dry start and the hot as balls temperatures, things were REALLY slow going. Our corn turned out like feed corn and ended up being fed to the chickens – at least I’ll have free corn stalks to decorate the house with for fall. The single surviving zucchini plant only gave us ONE stinking zuke. The 4 yellow squash plants did a little better and gave us about 10 squash, which we ate sautéed as a side dish and I breaded and froze up a big batch so we can enjoy it in the winter months. Our pepper plants are loaded with peppers, but they just started getting crazy, and I’m not sure how many we’ll get from them before the frost hits. Basil was a total bust. The bugs attacked the leaves, making them look like an ugly green snowflake. Green onions are still growing like wild, but not yet big enough to harvest and eat. But tomatoes? Ya, we are rolling in those. I’ve got over 100lbs in the freezer (for sauce, ketchup and bruschetta) and am averaging about 1 gallon sized freezer bag ever other day – as long as I can harvest them before the chickens attack them. So you could say I have a plethora of tomatoes. I was feeling greedy and scared the garden wouldn’t give me enough tomatoes to make all the tomato goodness I had in mind, so I did go out and purchase a bushel of Roma’s from a local farm. Just in case. Because you never know. So, um, ya. And with all 3 freezers having been stuffed to the gills with tomatoes, I needed to think of something to do with the 10lbs I had ripening on the counter. I could have made tomato butter, but we still had a jar left from the last batch I canned. So I decided upon tomato jam. Yes, you read that right – JAM. I don’t know why you’re so freaked out. Tomatoes after all are fruits. Except now it sounds weird calling it a fruit when you think about pasta sauce. And having one on a burger. And chili. Anyways….I had no idea what it tasted like and frankly, I didn’t care at this point. I just didn’t want those tomatoes to go to waste and with the busy weekend I had I couldn’t make anything that required much hands on time since I would be at home very little over the next two days, so tomato jam seemed like a great idea, and something I could put in the crock pot to cook down! Yay! Once it was all said and done, this was pretty easy to do and the taste is really good. It’s like a sweet hot barbecue sauce. I think it’s less like a jam and more like a chutney but that could be because of how I used an immersion blender to break the tomato halves down. It will be great on chicken, fish, even on a ham as a glaze or dipping sauce. Pretty universal stuff! 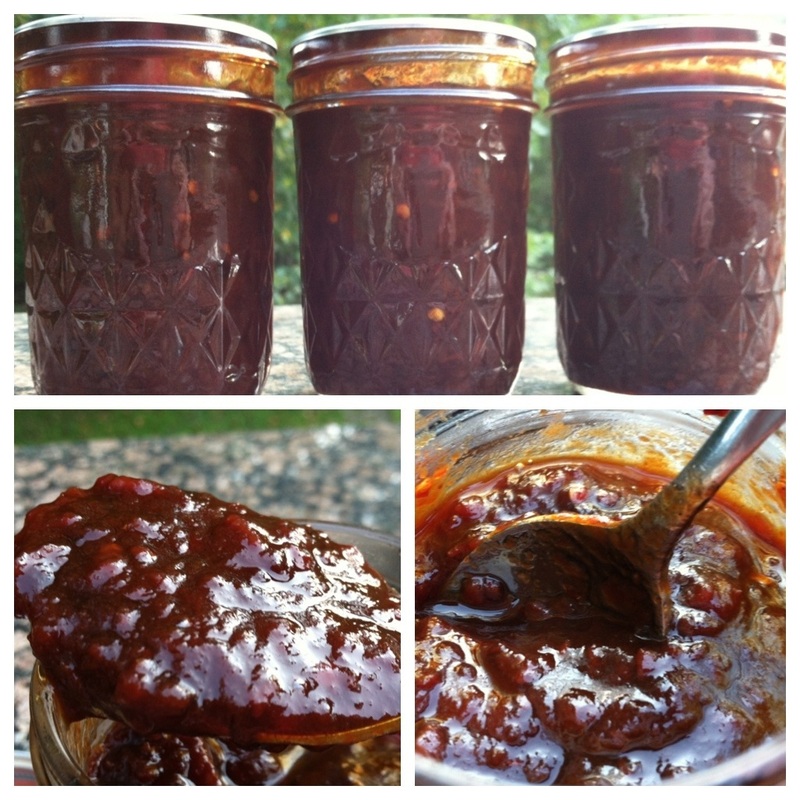 As with canning any type of sauce, jam or chutney, your yield will vary. It depends upon the cook time, type of tomato used, how high the sun is in the sky (kidding!) so if you don’t get 10 + 2 jars worth or you get more, don’t fret. I could only fit 10 jam jars into the pot I was using, so I ended up filling two pint jars. One went into the fridge for me to use, the other went to my sister-in-law. And as a side note, this is GLUTEN FREE. Add your chopped tomatoes, sugar and salt to your crock pot. Using an immersion blender, pulse through the tomato halves to break them down some and get them nice and juicy. Stir to combine everything. Set your crock pot to low and place the lid on where it is slightly vented to allow the liquid to evaporate. Cooking times will vary depending upon how juicy your romas are or if you sub in a different type of tomato – I cooked mine for 18 hours. Once your tomatoes have reduced by half and are a nice, dark burgundy transfer them to a large stainless sauce pot. Add the lime juice, ginger and red pepper flakes. Cook for 15 minutes until hot and bubbling. If you desire a thicker consistency, cook until you reach that. Once your jam reaches the desired consistency, remove from heat and fill your jars, leaving 1/4 inch head space. Wipe rims with a white vinegar dipped cloth, apply lids, and secure bands to finger tight. Process your jars in your boiling water batch canner for 20 minutes. After 20 minutes, remove the jars from the water bath and allow them to cool for 24 hours. Test the seals – any jars that did not seal can be reprocessed or put in the fridge to use. Label jam and store in a cool dark place for up to 1 year. The avocado is another one of those super foods. There are a lot of people who dismiss it from their diets because of its high calorie content. I on the other hand love it and am trying to sub it in for mayo whenever I can. I decided to give it a whirl in my egg salad sandwich for lunch. I’m overrun with fresh eggs from my chickens, so I needed another option to eat them all up! Wow, am I glad I subbed the mayo here! It’s fantastic. It was filling and flavorful, even without having all the yolk in it. I enjoyed it on a Syrian roll, but it would be fantastic on crackers, toasted french bread, or even in a salad. The recipe below? It’s one like my Bubba or mom would have written up because there aren’t really any exact measurements. You have to season it to your own tastes. So use it as a guideline, a starting point for you to jump off with your own avocado egg salad flavor. But most of all, enjoy it! I use a potato ricer when I make my egg salad because it gets everything nice and creamy.You can chop all this by hand if you want, or toss it into a food processor and pulse a couple of times until everything is combined. Start out by cutting 2 of the hard-boiled eggs in half and disposing of the egg yolks (I give mine to my dog, it makes his coat nice and shiny and he loves the taste). Place the whole eggs, egg whites and avocado into a potato ricer that has been placed over a bowl. Press down. 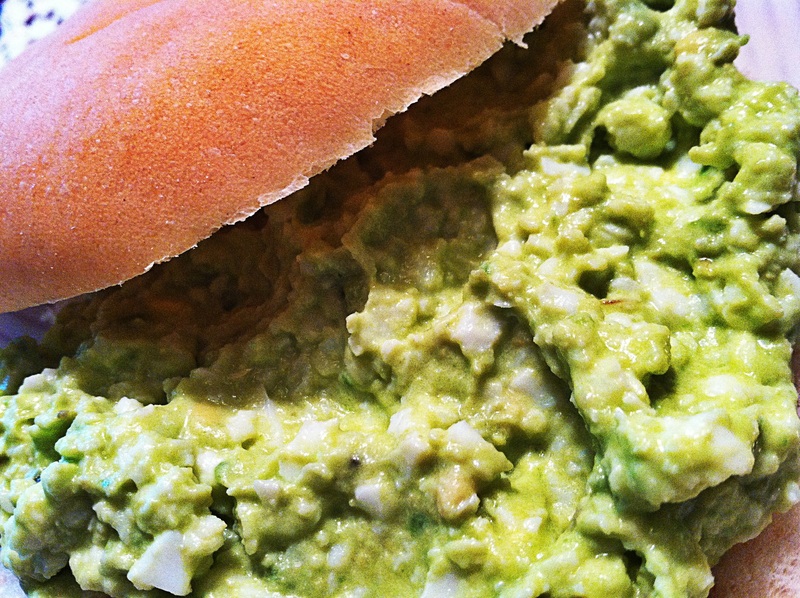 Clean off any additional egg and avocado from the ricer. Season with garlic salt & pepper to your liking, and add a squirt of lemon juice. Stir to combine. Generously spread onto the bread of your choice and serve. Note: Be sure to cover tightly when storing any leftovers. I place a piece of saran wrap snugly against the egg salad to avoid any possible discoloration of the avocado. Nope. You aren’t seeing things. 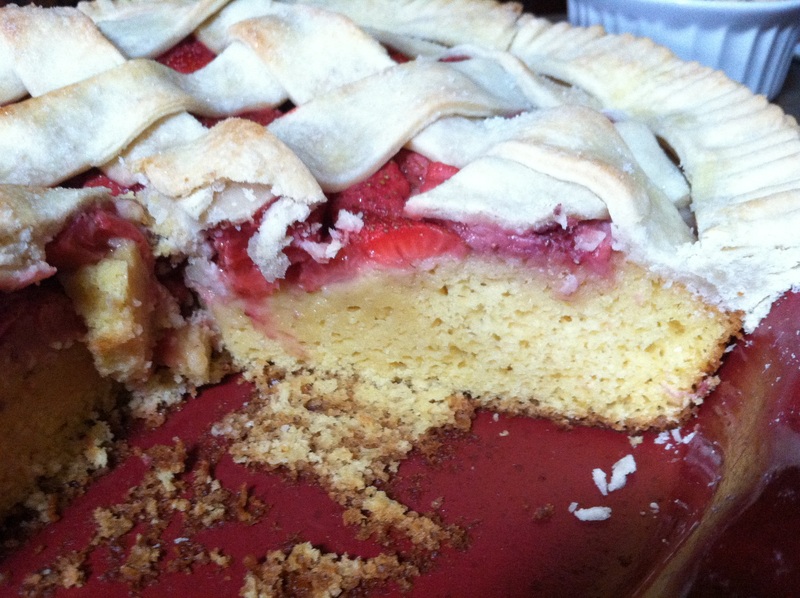 The title of this dessert is in fact Strawberry Cake Pie. The bottom layer is cake which you bake in a pie pan. You then top it with strawberries that have been coated in sugar and let to sit and get juicy for a bit. 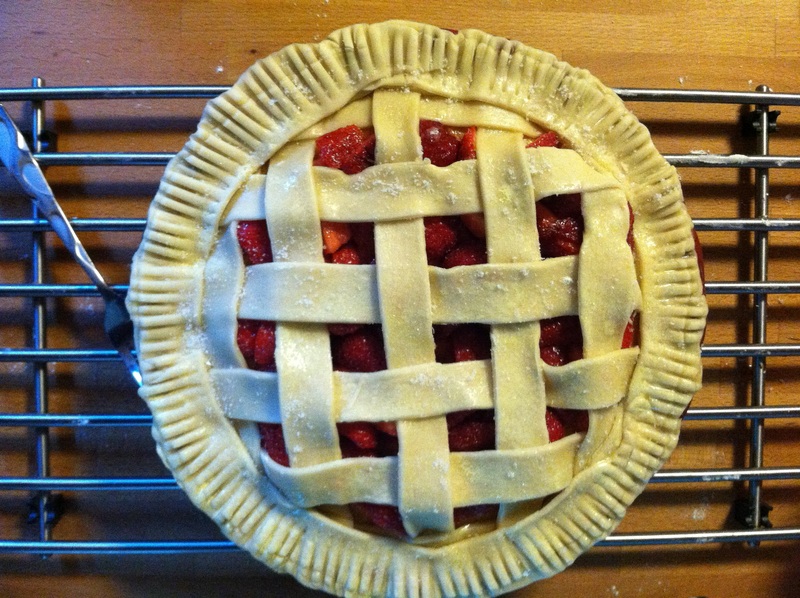 Then…wait for it…you top it with lattice patterned pie crust. YES! It’s a delicious trick. Because it LOOKS like a strawberry pie. But cut into it and you’ve got that yummy cake layer that has soaked up the juices from the strawberries during round 2 of baking. Bliss. Now, my crust job doesn’t look that fabulous…and I could totally try to blame it on the fact that I was making this dessert at 7am on the 4th of July. But I won’t. Because when it comes down to it, I don’t put a whole lot of time into making things look bakery quality fantastic. I don’t want to fuss and fret that I’ve made the fork pressed edges of the crust perfectly even and didn’t overlap the fork at all on the way around. So what if it doesn’t look like it’s ready for its glossy magazine cover spread. If it looks decent enough and tastes good, I’m a happy girl. I did use boxed cake mix and *gasp* store-bought pie crust due to time constraints. 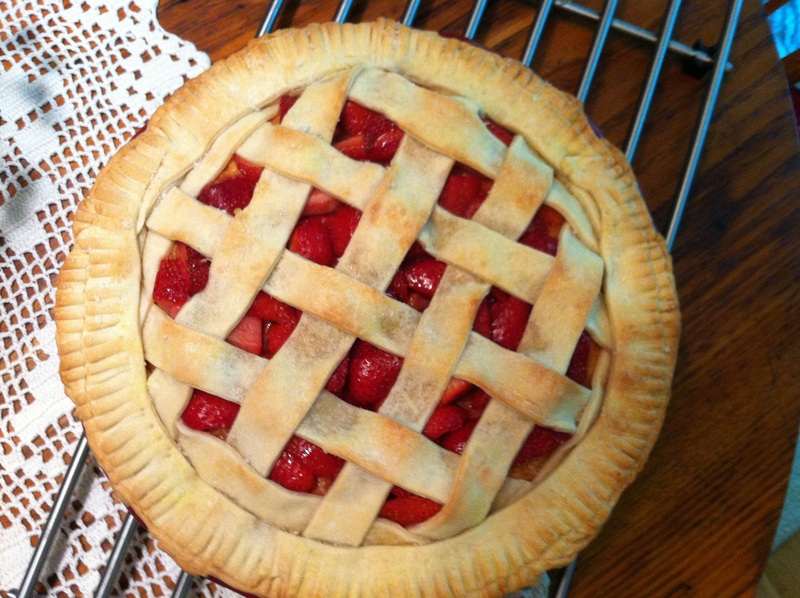 Next time, I’ll double the strawberries and do homemade pie crust. Skip the lattice top and just use mini cookie cutters to let the berries show through. Whether you make it with from scratch ingredients or punk out and use store bought, it’s still a crowd pleasing dessert. I can see making it with apples in the future…or a blackberry top. Yum. Preheat your oven to 350 degrees. Grease a 9in pie plate. In a medium bowl, add cake mix, eggs, water, oil & vanilla. Beat for 2-3 minutes until all ingredients are combined and no large lumps remain. Pour all of the batter into your greased pie plate (or ¾ full) and bake for 25 minutes, until the edges are set and the center is slightly wobbly. Remove from the oven and let cool slightly. While your cake is baking, make the strawberry filling – in a small bowl combine the strawberries, ¼ cup sugar and pinch of salt. Stir to coat and let sit for 20 minutes. Sprinkle cutting board with flour. Unroll your pie dough and slice into 1in strips and set aside. 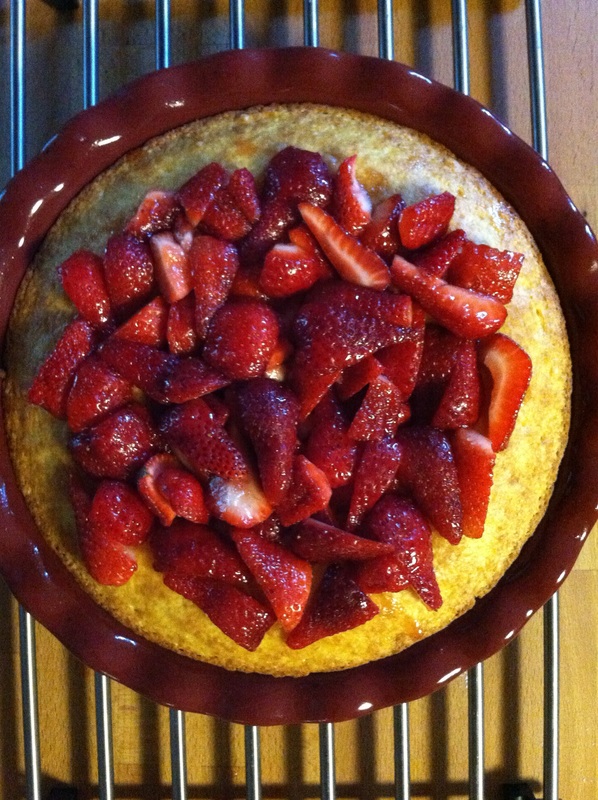 Drain your strawberries and top your slightly cooled cake with them, pressing into the cake as you add them. Increase your oven temp to 450 degrees. 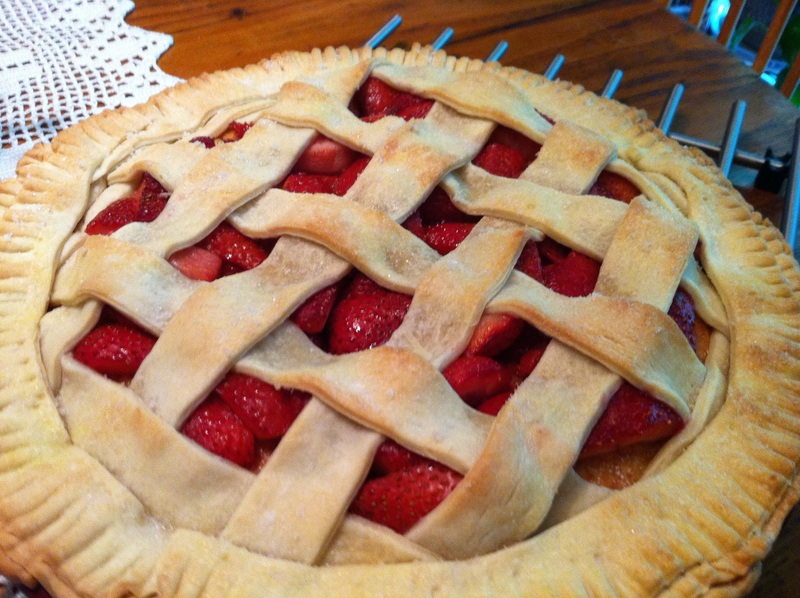 You will now top your strawberries with the strips of pie dough, spacing 1in apart. To create a lattice design, lift every other horizontal strip and place a strip of crust vertically. Lay down lifted strips and continue in an alternating pattern. To make the edges of the crust, use the leftover pieces, pressing the ends together to bind them. Use a fork to press the edges. Brush crust with the butter and sprinkle with 1-2 teaspoons sugar. Bake for 15 minutes in your 450 degree oven. Let cool and serve with ice cream or whipped cream.